Plenty of people have had excellent experiences with the Chili Peppers; I’m not one of them. They were never mine in any meaningful way. In the same way that a Cure song played at a party in college bat-signaled to me that I was in a place among my people, drunk dudes air-jamming to “Knock Me Down” or making white boy bass face to “Give It Away” tended to send me looking for my coat. I indeed was not on their uplift mofo party plan, though it seemed like the rest of the world was down for a funky, funky time. The Red Hot Chili Peppers have received seven Grammy awards and sold around 70 million records. The Cure have had one Grammy nomination and sold roughly a third of that. That’s certainly millions more than most, but still, though I am a well-adjusted adult with plenty of friends and a distinctly nonsubterranean existence, there’s something about the Hall of Fame snub that sort of wounds me. The cool kids win again, and the weirdos are left skulking in the dark. It’s OK, I tell myself. From angst comes really freaking gorgeous art, and there’s always next year, or even several from now. It’s not like they’re gonna stop making depressed teenagers any time soon, and on the day they finally do get inducted, it’ll be extra icing sugar sweet. Probably something just like heaven. speaking of (former) goth wailers...didja see the pics of sinead o'connor getting married in Las Vegas? "white boy bass face" LOVE IT! yah, wish I'd been young enough for the Cure during my dark years, but my finding them later probably save me $50,000 in therapy and perhaps from some explosively violent end. now I have a wife and two kids, but alas, no bass face. can't have it all, I guess. The Cure has always been one of my favourite bands and in various times of my life, they were my go to band. I could wallow in my pity or I could sing out loud – Friday I'm in love. They're the perfect band for all moods. I get the peppers might be more popular and have more statues but that's not what really counts. The Rock and Roll Hall of Fame has always seemed like a craptastic way to say who's more popular – they're wrong. I like both bands, but The Smiths are better! Better, I don't know, but as important – you will get no argument from me. Hall of fame or not, I'll keep listening! 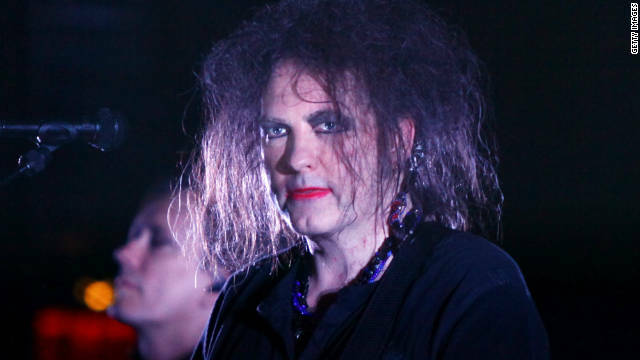 Robert Smith, I have always loved and will always love you! Jeeze Louise... what a freak show. Does anyone actually care about the rock n' roll hall of fame? The Hall of Fame is a joke. They should call it the music hall of fame not rock and roll. The Cure helped me through High School, too! I love all their records, and also hate that they constantly get labeled "goth". They truly deserve the Rock n Roll hall of fame! In high school in the mid 80's I had the HUGEST crush on a girl who dressed like Robert Smith. Wow, I absolutely agree with you. The Cure have to be one of the most influential bands of the last 30 years in my opinion. I hate the word 'emo' but i would have to say The Cure were an 'emotional' band 20 years before that term was ever coined by the mainstream. I do appreciate RHCP but where they took an existing form of music 'funk' and combined it with punk and rock, I would have to say The Cure actually invented their own genre of music. DCFC anyone?? If you bash them over the head with a baseball bat, that should take care of things.